Staff photo by Cole Dittmer. 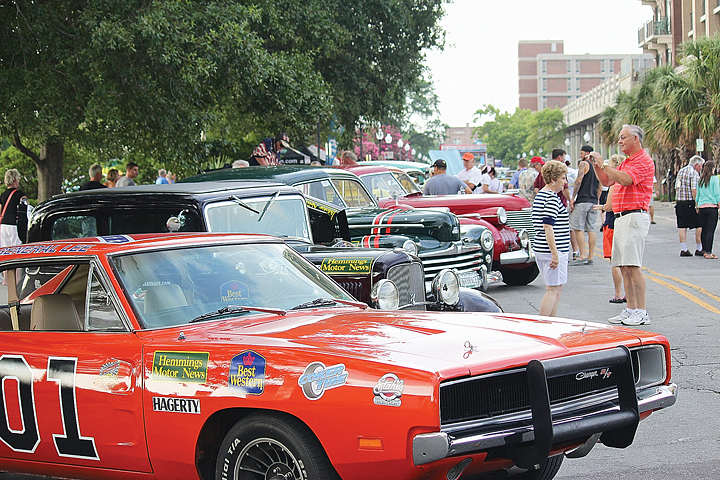 Wilmington Realtor Michelle Clark's 1969 Dodge Charger General Lee was one of the many antique autos to stop by downtown Wilmington along the 2014 Great Race, which followed a course from Maine to Florida. One after one, antique autos from around the country rumbled through the Water Street checkpoint in downtown Wilmington for one of the stops for the 2014 Hemmings Motor News Great Race on Thursday, June 26. Started in 1983, the Great Race is an endurance car race that tests antique autos and their teams on cross-country routes throughout the United States. This year’s route stretched nearly 2,500 miles from Ogunquit, Maine, to The Villages, Fla., and wound through cities along the Eastern Seaboard. A large crowd lined the street in front of the Hilton Wilmington Riverside to welcome the antique autos ranging from 45 to nearly 100 years old. Wilmington resident and Realtor Michelle Clark’s 1969 Dodge Charger General Lee led the parade into downtown with navigator Buddy Green and driver George Barbour behind the wheel. Clark, who has owned the car for nearly one year, said her love for that specific model started when “The Dukes of Hazard” was on air from 1979-1985. This was the third year in a row Green served as navigator for a car in the Great Race, with his father, Bill Green, driving the first two years. For the elder Green, competing in the Great Race was an item on his bucket list. “I am enjoying every minute of it, but it is a little different being support and not being in the car this year,” Bill Green said. Cars in the Great Race have to drive at or under the posted speed limits at all times and must adhere to a strict route and schedule to earn points. Directions for the routes are sent to the cars along the way to keep drivers and navigators on their feet. As the navigator, Buddy Green said his job is to keep the car on the correct route and on the correct time. At every stop the teams have to survey their antique autos to check for any necessary repairs and, with the ages of some of the cars, Green said repairs are often needed. The Great Race ended in Villages, Fla., on Sunday, June 29. For the third year in a row the winning team was Barry and Irene Jason from Keller, Texas, driving a 1969 Ford Mustang.